Micellar water is a huge part of my daily beauty routine, as I'm sure it is for many of you reading this too. I remember when it became a 'thing', heck, I remember the days before micellar water when our cleansing options were long winded face washes or dare I say it, face wipes! Micellar waters are the perfect in between, they're quick, they're effective, they're what we've all been searching for... It's easy to see why they're one of the best selling beauty products in the UK. 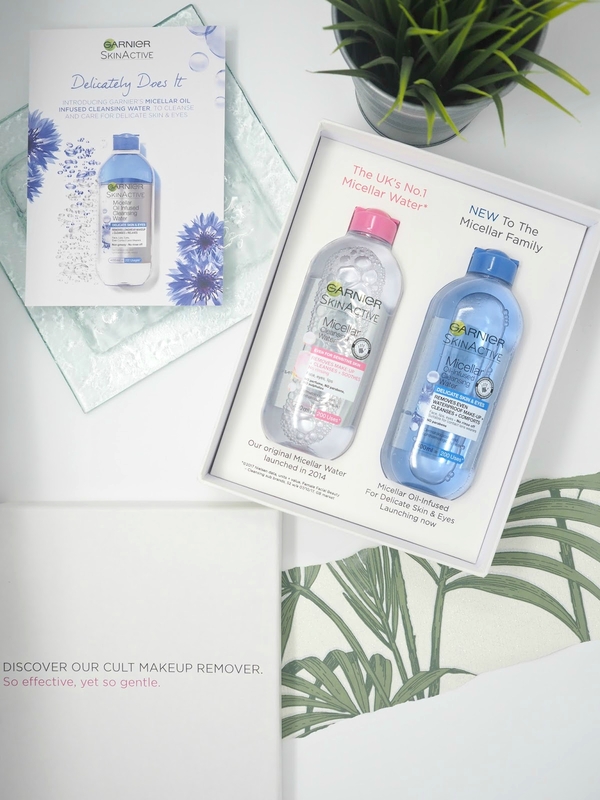 I have a few favourites from different brands which I repurchase over and over, one being the Garnier Skinactive original Micellar Cleansing Water, which was the first release from their ever growing micellar collection. It's fair to say that my skin is pretty sensitive, especially my eye area, so when Garnier kindly sent me their brand new Micellar Water I couldn't have been more excited to give it a try. The new version is aimed at those who suffer from delicate skin and eyes, which sounds just perfect for me, it's oil infused, contains no parabens and is enriched with cornflower water, meaning it's incredibly gentle and is suitable for contact lens wearers. As this contains oil, before each use you need to give the bottle a good shake, and then you simply apply to a cotton pad and sweep across the face. This removes your makeup with ease, even waterproof eye makeup is dissolved with no need for rubbing or any pressure. For those of you who like an easy life, or for those who need to be quick when cleansing, you'll be happy to know that there is no need to rinse the face after use, and worry not, there's no greasy or oily residue left after use either. I can only speak for myself, but my skin is left feeling soft, smooth and clean, with the added bonus of feeling hydrated rather than tight, which can often be a problem after using a cleanser or toner. I find that this removes my makeup even easier than the original, I assume this is thanks to the addition of the oil and it feels so gentle on my skin. It's definitely a welcome addition to my bathroom cabinet! The 400ml bottle will give you approximately 200 uses, and at only £5.99 (and currently £3.99 in Boots), that works out really affordable per use. I find that the Primark micellar water takes my make-up off much better than the original Garnier one, I really need to this new one a go though. I hate having to double cleanse my skin as it flares up when I rinse it too much so this sounds perfect.